Simon Geschke's Giant TCR Advanced SL 0 - LA VELOCITA. We grabbed Tour de France stage winner Simon Geschke's lovely new TCR Advanced SL 0 for a quick gander. Could this be the last caliper version of this legendary steed? It's interesting to see the Sunweb team opting for the all-rounder TCR Advanced for the Tour Down Under. It makes sense on the mixed parcours. We've ridden a few different iterations of the TCR Advanced and it is always stiff and always fast. The Advanced SL 0 is the heart of the bike. It's a light and stiff race rocket, especially with that ISP seatpost reducing material. The frame shape itself looks smooth and understated surrounded by the aggressive aero machines that have become ubiquitous in the pro peloton. Drivetrain is full Shimano Dura Ace 9070 with a very swish colour-coded Pioneer power meter. As excited as we are for the 9100 series Dura Ace, the 9000 is gorgeous and it'll be sad to see its aluminium shine disappear. The mechanic saw me photographing the rig and scooted out to drop on this mystery computer. It's badged "Giant Neos Track". Its form factor is reminiscent of a Bryton computer but there's scant details out about the unit. 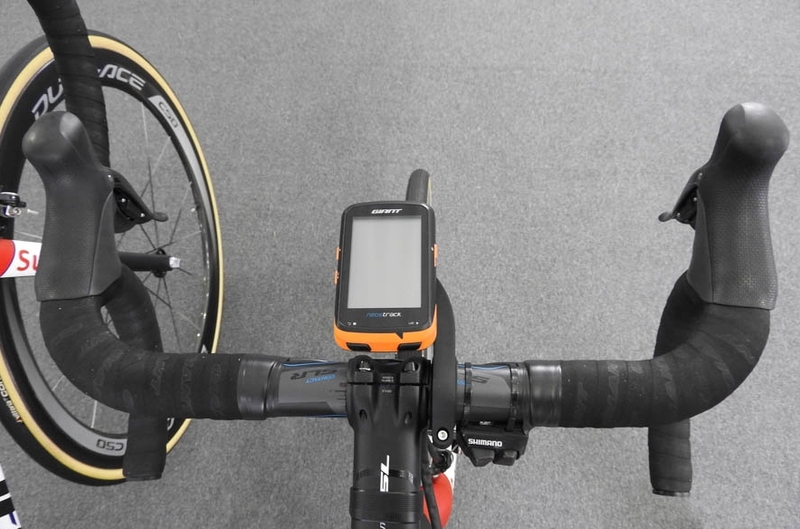 Given the presence of the Power Meter, you can expect it to tick all the regular boxes of GPS enabled, Ant+, Bluetooth etc. The clean cockpit setup features climbing shifters on the bars. Simon will likely use them quite a bit with two summit finishes and a healthy smattering of climbs through the week. Finishing kit is all Giant. stem, bars, saddle, you name it! No deviation from the Giant in house brand.